We are making paper airplanes, Declan and I. Listen to the sound of crumpling and fits. “Sure you can. Let me show you….you just crease it right here…” Two seconds of effort. Crumple. Toss, Yell. “Some people aren’t ready for new things!” he grumbled. “You’re always ready. You try, and you get better and better. Trust me on that.” That was my advice. 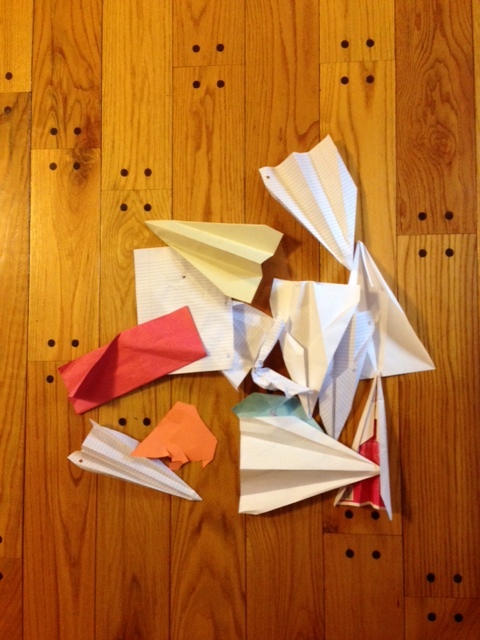 I watched myself crumple my own paper airplanes. Oh, the mirror. It can be cruel, but always honest. Reminds me of a contest we had at one of my old jobs – you know, the “morale boosting” type – a gift card for creating the paper airplane that flew the farthest. Contestant after contestant, wielding all manner of flying paper machines, from jet to dirigible, launched their creations and watched, all hope and optimism, as their hand-crafted contraptions flew stunningly far or, more often, immediately dove earthward. Watching all of this transpire, I was struck with inspiration: I took my carefully folded, semi-generic airplane and crumpled it into a ball, stepped up to the throwing line, and hurled it like an outfielder in the bottom of the 9th, opposing team’s runner rounding third and heading for home. There were arguments – about the rules, the intent of the system, fairness. This will always happen when the crumpled out-distances the traditional. Followed your trail here from l.palmer, liked the first post I read. But this, this makes me click the follow button, and then the reblog button. Wow. I am so honored by that. Thank you. Oh wow. Deep. Not what I was expecting when I clicked on the title of this post. But so totally true. Kudos for that. More of us need to have that mirror turned around, to have to face the truth like that. Thank you. It’s funny how we see the truth in the simplest of places.